Weary Herakles ("Herakles Farnese" type) Roman, Imperial Period, mid to late 2nd century A.D.
First in a series of occasional articles on the complex issues surrounding some works in the collection of the Museum of Fine Arts. ANTALYA, Turkey — On its own, it seems unremarkable: the bottom half of an 1,800-year-old marble statue showing the legs and lower torso of a muscular figure. But here, in one of Turkey’s most important museums, the “Weary Herakles” has served as a symbol of the many works stolen from the country, shuffled to shady dealers, and sold to American museums. 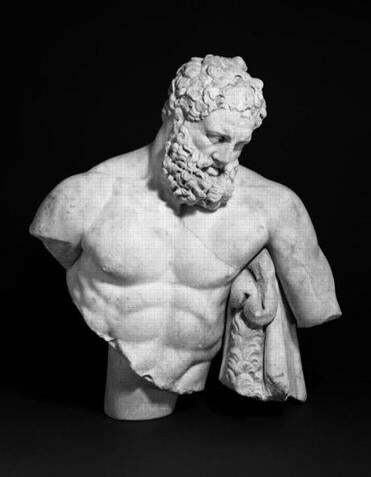 The top half of “Herakles,” which shows the bearded hero leaning on his club, has been at the Museum of Fine Arts since 1982, given by a New York couple whose collecting practices have long been called into question. After years of denial and sputtering negotiations, Turkey will finally get its wish. The MFA has decided the piece should be reunited with its other half and sent back to Turkey. The MFA aims to formalize an agreement with Turkish officials this year — an agreement that the MFA hopes will enable Bostonians to see the unified statue through a short-term loan as early as 2012. “This is a beautiful piece and we believe it should be back in Turkey, and that’s a big deal,” said MFA deputy director Katherine Getchell. In agreeing to the return, the MFA is making a rare about-face, acknowledging what archaeologists and other critics have long argued: The museum should never have allowed the top half of the statue to enter the collection. But the story of the "Herakles" also story of how museums acquired some works in the past, when swashbuckling curators grabbed first and asked detailed questions later. And the expected resolution reflects the way museum practices have changed in the modern era. Ethical guidelines are now in place to help guide museums through acquisitions; the threat of costly lawsuits against those who ignore the rules hangs over the proceedings. Still, those who have advocated for the return of the MFA’s half of “Weary Herakles” say they’re amazed it has taken so long to resolve the dispute. In Turkey, the quest to make “Herakles” whole has been championed by archaeologists and government officials. To that end, they’ve put up far more than a traditional wall label next to their half at the Antalya Museum. A large collage featuring newspaper clippings and photographs details the battle with the MFA. Because Turkey’s “Herakles” is a fragment — and the museum is full of towering antiquities in excellent condition — the collage poster helps to get tourists to stop and take notice. Though there’s no documentation detailing the discovery of the MFA’s half, Turkish archaeologists say they are sure it was found in the same place — and around the same time — as the lower section of the statue. It was in 1980 that Turkish archaeologists found the southern baths where, in about 15 feet of rubble, lay a dozen statues. One of the discoveries was the bottom section of “Herakles,” a Roman statue in eight pieces. The top half was probably in the area at the same time, though it wasn’t spotted by the archaeologists, according to Inci Delemen, a professor at Istanbul University and today the deputy director of the Perge excavations. In a recent phone interview, Delemen said that security was lax in those days, and that she suspects one of the crew members found the upper half and hustled it out of the site. It is simply too much of a coincidence that the top half emerged in public in 1981, one year after the discovery of the bottom half, said Delemen. The MFA purchased the piece in 1981 with New York collectors Leon Levy, a Wall Street millionaire, and his wife, Shelby White, from a German dealer named Mohammad Yeganeh. The arrangement called for the MFA to take possession of the work — it went on display on April 2, 1982 — but to receive the remaining 50 percent ownership only after Levy’s death. As for the top half’s origin, Yeganeh told the collectors that it came from “his mother’s collection and before that from a dealer in Germany about 1950,” according to MFA records. “It was obviously taken from the excavation,” she said. The “Herakles” wasn’t the only questionable work purchased by Levy and White. In fact, the pair gave prized antiquities to a range of museums across the United States. In recent years, those works have come under increased scrutiny and, in some cases, have been returned after evidence showed the pieces were looted illegally before coming to the United States. But in 1982, no questions were apparently raised. It wasn’t until 1990 that the story of “Weary Herakles” emerged. That’s when the top half went on display at the Metropolitan Museum of Art. Connoisseur magazine published an article linking the MFA’s half, which it valued at $1.5 million, with the piece in Antalya. Vermuele, who died at 83 in 2008, would later admit that the museum did not know whether some works in its collection had been illicitly removed from other countries before finding their way into the MFA. Eventually, the museum told him not to speak to the press. He avoided interviews in his final years, at one point impersonating an elderly lady on the telephone to pretend he was unreachable. But in 1990, when confronted by the Connoisseur article, Vermuele did offer a compelling idea: If there were questions about the statue, he said, the first step would be to make plaster casts of the two halves and see if they fit. The test took place on a Friday in September at the MFA. Then a Bryn Mawr professor of classical and near eastern archaeology, Ridgway had been asked by the Turkish government to observe the test. Also in the room were MFA research director Arthur Beale, Vermuele, attorney Scott Tross, and archaeologist Jale Inan, who had found the bottom section. That was an important distinction because Turkish law protects only artifacts smuggled out after 1906, he noted. That’s where the conflict remained until 2003, when Leon Levy died. In his will, the remaining ownership of the piece was given to the MFA. That meant the museum could decide on the fate of “Herakles” without a donor getting involved. Still, it took Rogers until 2006 to write to Attila Koc, the Turkish minister of culture, to let him know of the museum’s full ownership. In March 2007, Getchell held the first of several meetings that would take place with Turkish officials, the most recent in May 2010, when a Turkish delegation came to the MFA. The top half of “Herakles” was last seen at the MFA in 2007, when it was featured in the museum’s “Sculpture in Prints” show. Since then, the statue has been in storage. It’s currently packed away in a cabinet in the Ancient World Wing, wrapped in foam. Getchell declined to discuss whether the work should have been purchased in the first place. She wasn’t at the museum then. In Turkey, there’s a similar desire to just focus on the return. Osman Murat Suslu, Turkey’s general director of museums and cultural heritage, said that he’s thrilled that after so many years, the “Weary Herakles” is coming home. He is even willing to give the MFA a short-term loan of the unified piece for an exhibition. Getchell had requested that during negotiations. The MFA can’t predict when the reunited statue might go on display, but Getchell said that the MFA hoped the unified piece would be seen first in Boston. If Turkey agrees to loan the bottom half to the MFA, it would take several months for the piece to be put together and conserved. That would leave the MFA with a rough target of 2012 for unveiling the two halves, Getchell said. Ultimately, the unified piece would return to Turkey. Suslu said he takes great pride in the resolution of the dispute.